In this JQuery video tutorial I introduce the JQuery UI library. 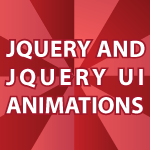 I also show you numerous ways to animate elements using JQuery. I cover hide, show, toggle, fadeOut, fadeTo, slideUp, slideDown, animate and effect. I also cover numerous other properties. If you missed part 1 of this tutorial watch it first JQuery Video Tutorial. All of the code and additional comments on the code follow the video. If you have any questions or comments leave them below. I am watching your tutorials from very earlier. It wasn’t working for me either. It turns out there are some strange characters that look similar to quotes inserted where a few of the quotes should be in the code above. Once I changed those it started working. You are my Hero.Guide me like a mentor.Thanks for your great tutorials.